It took me about three months before I came up with a name that I liked for my blog. there were a lot of different choices, but most of my ideas already had the .com URL taken. When I decided on The T-Shirt Diaries because I love upcycling t-shirts and found the URL was available I grabbed it and voila here I am. Here is the thing, although I do intend to sell a ton of T-shirt dresses I didn't think The T-Shirt Diaries was the right name for my ETSY shop. I knew I needed something that was easy to remember and easy to spell. I also needed to find a name that was available on ETSY. I have always loved the name "Punk Rock Babies." Apparently so did someone else. I like the idea of babies being a little punky and funky so I figured I would stick with that theme. Allow me to introduce you to: PunkRockBaby. It was available, it was cute, and now it is the name of my ETSY shop. (Please note that the name that you register your ETSY with does not have to be the name of your shop, but it doesn't hurt). I have to say I love ETSY shops that are very well coordinated with the blogs attached to them. I would highly recommend it, but only if it makes sense. One example, a favorite blog of mine is I am Momma Hear Me Roar and her ETSY shop is simply called ROAR. It is simple, easy to remember, and just makes sense. Now if I took apart my blog name and just named it Diaries, well that doesn't work because people would think I was selling diaries, which I am not (right now at least). So for today you are going to pick a name, you are going to go to ETSY.com and on the top left hand corner you will click on "SELL." See the Lovely Button Marked Sell? It's Calling Your Name. 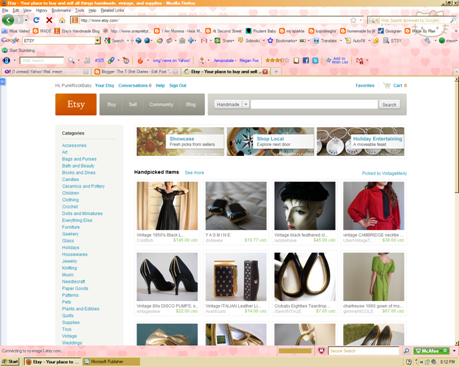 Read the page that comes up and find out all about what is or is not able to be sold. Then click on the GREEN get started button at the very bottom and fill out the form. Do not get frustrated if you first name is already taken, it's okay you will come up with something equally as awesome or, if it is a beautiful one name word you can register the shop with your name as the user name and just use that as you shops name. Congrats you have completed day one of setting up an ETSY shop! Doesn't that feel good?